I am attending a conference. in Trondheim In order to save money, I booked into P-Hotel. 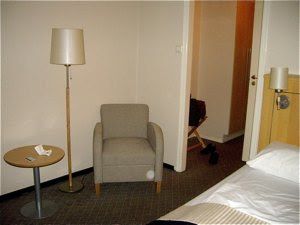 I know they say that less is more, the P-Hotel states that I as customer gain from a low budget, low service hotel brand. I say that for a little higher price than I pay at P-Hotel, I could get a room elsewhere for the same price with not less, but more goods and service. What do I miss the most during my stay. A breakfast buffet!! 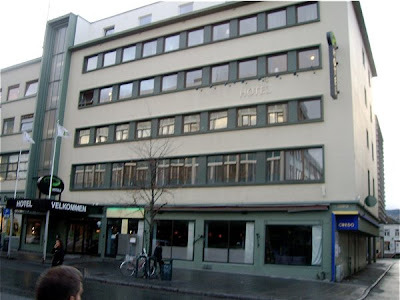 The hotel is located at Nordre Gate, a downtown street with shops and restaurants near by. 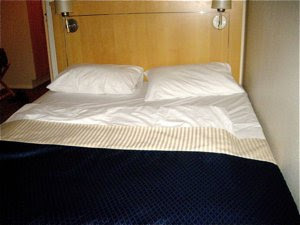 The hotel is a 5 minutes walk away from the main railway station. From the railway station you may catch north- and southbound train services, busses, and the shuttle bus to the main airport. The receptionist was the only member of staff I met, and she did a great job. As I asked for a place to dine she gave me her favourite place to eat. As I needed needle and thread to mend my trousers she found it in her drawer. Very kind and charming, as the service was not in short supply as much of the other stuff at the hotel. Decent sized room and bath with a rather gloomy view into a grey wall. The good thing was that it had a very silent location, turning away from the street. There was one large - and very comfortable double bed, a comfortable chair, and a slightly uncomfortable desk, on which I wrote this story. White pleasant and rather neutral colouring. It has a designer hotel character, without that extra twist that would set it out from other similar hotels. The room is well maintained. Not immaculately at there are some small signs of wear and tear on carpets, tiles, and lamp shades. The floor is covered with wall to wall carpeting, to be critical of, as it is hard to keep clean. Still it it had no larger stains and seemed clean enough, as carpets come. There were a little dust at the top of picture frames and the mirror. A nice flat screen TV and water cooker with tea bags and coffee. No hair dryer or mini bar, so you have to leave the hotels as there is no inhouse bar. Room and bathroom acceptable at the price I paid. I love to wake up in the morning and, after a shower, walk down and choose from a breakfast buffet. No such luck here. This is rather a difficult point, as the breakfast is included, but someone has chosen what to eat. At 6.30 AM I could decide whether I would like to have one sandwich with either cheese and ham, juice, and fresh juice delivered to my door. And coffee? You have to brew it yourself. I would love to choose what bread to choose, yogurt, what fruit to eat - and the smell of freshly made coffee and a newspaper. 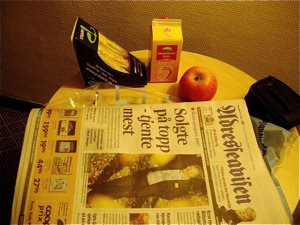 P-Hotel may claim that this is their idea of breakfast included, but it is not mine. This is not the way to save money for the guest. You may like it, I do not. P-Hotel has neither inhouse restaurant, nor inhouse bar. 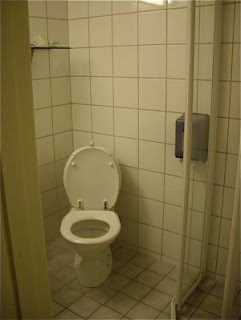 This is a hotel stripped of every kind of necessary and unnecessary facilities. The only facilities to talk of are the free high speed wireless internet access and a free PC in the lobby. The design and hygiene in the hotel is acceptable, but the wall to wall carpeting in the corridors is partly worn and stained. The corridors look a little shabby. I paid NOK 795 for one (a little less than 100 EURO), an acceptable price for the room, but I feel that it should have included more.